It is not just mid-autumn decorations that light up the streets of Shenzhen this festive season, Renvale Capital’s public buses are doing it too. The latest advertiser to add zest into Shenzhen’s public transportation system through unique and interesting marketing campaigns is Renvale Capital, which aims to position itself as “the world’s leading private investment firm”. Their advertisement campaign is displayed on a huge fleet of public buses, and run city wide with particular concentration on the central district area. It is decked in a splendid array of colors and is complete with LED lights to celebrate the current mid-autumn festival in China. Not all of their buses are equipped with this feature but for those that do, they are equipped with LED lights that line up on both sides of the bus, providing a beautiful aesthetic, and increasing the visibility of bus advertisements at night and rainy weather. This design, which is made exclusively by Renvale Capital’s marketing team for their Shenzhen advertising campaign, seems to receive profound appreciation by local passengers in their social media posts and comments. 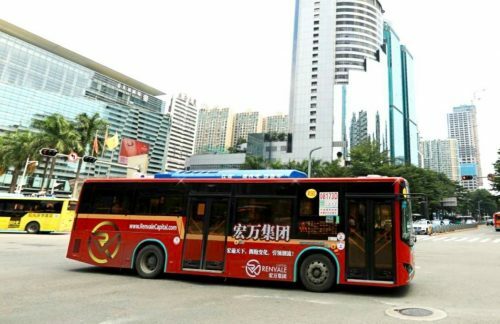 The firm’s many buses run through Shenzhen’s heavily populated areas such as the CBD district top universities – Shenzhen University and South University of Science and Technology of China, Shenzhen’s largest shopping mall – MIXC City, and famous theme park – Window of the World. The firm has laid out plans to replicate the campaign in other regions of which they have actively begun their marketing initiatives particularly within public transportation systems and bulletin boards, such as Japan, South Korea and other cities in China.